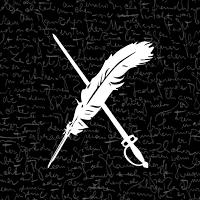 Hello and welcome to another Weekend Writing Warriors post! Thank you to all of you who visited my post last weekend! 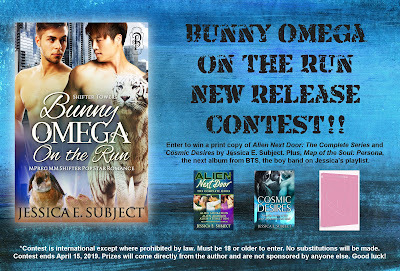 I'm continuing with more BUNNY OMEGA ON THE RUN, an MPreg MM Shifter Pop Star Romance. This story is available in digital and print at Amazon. Set-up: Last weekend, TK revealed to Kish that he's looking for a friend before their conversation is interrupted by the waiter. I'm skipping ahead to the next chapter. And I think this is the first snippet I've shared in TK's POV. Anyway, TK is in a meeting with his manager Conn regarding the music video they just shot. Things aren't going too well. “Because I didn’t.” Not caring how mad Conn got, I leaned back in my chair. I’d told him all along I hadn’t wanted to work with her, and I couldn’t make it seem like a real kiss if she was the model they went with. As a pop star, I never expected to find true love. Not in a world where everything is temporary and often fake. But then he ran into me. Not once, but twice. My tiger instantly recognized him as my mate. Now, I just have to convince Kish that what we have is real. The oldest of ten kids, I saw what my mother went through after my father left. After that, I started taking blockers so I would never go into heat, never have kids. Because love was for the weak. And I was doing just fine on my own. Then I met TK. Literally smacked right into him. But no matter how much I wanted it to be true, I refused to believe that he could love a bunny shifter from the wrong part of town. 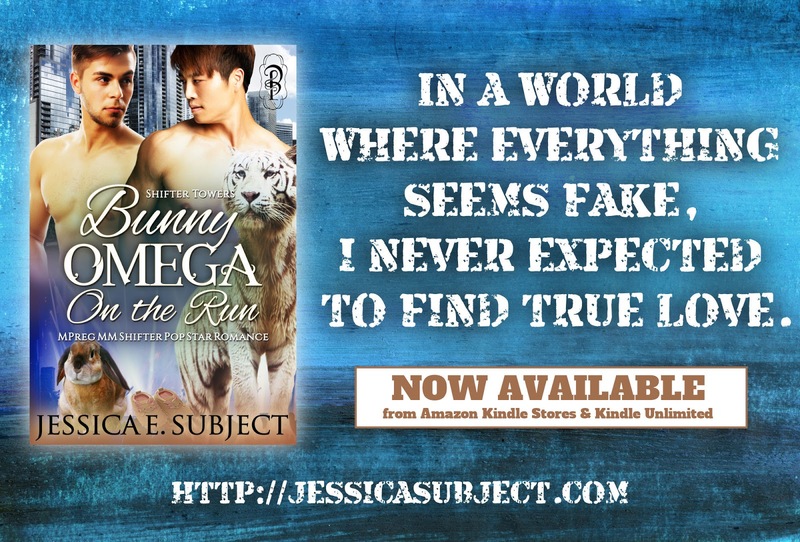 Bunny Omega on the Run is a super sweet with knotty heat MM mpreg shifter popstar romance. It is book 1 of the Shifter Towers series but can be read as a standalone. Be sure to visit the other Weekend Writing Participants! Thank you to all of you who visited my post last weekend! 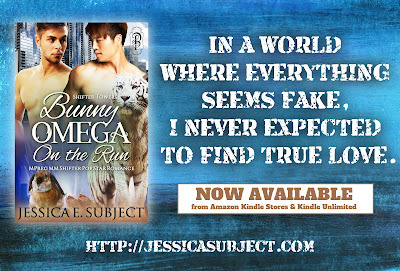 I'm continuing with more BUNNY OMEGA ON THE RUN, an MPreg MM Shifter Pop Star Romance. This story is now available in digital and print at Amazon. And I'm hosting a release contest. This is the last weekend to enter. Find that at the bottom of this post. Set-up: Last weekend, TK invited Kish to lunch, and Kish wasn't sure what to think about that. Author note: And this is where they're interrupted by the waiter. Enter to WIN a print copy of Alien Next Door: The Complete Series and Cosmic Desires by Jessica E. Subject. 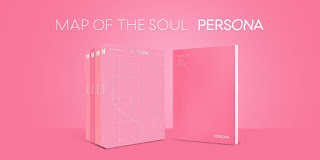 Plus, Map of the Soul: Persona, the next album from BTS, the boy band that has a permanent place on Jessica's writing and life playlist. *Contest is international except where prohibited by law. Must be 18 or older to enter. No substitutions will be made. 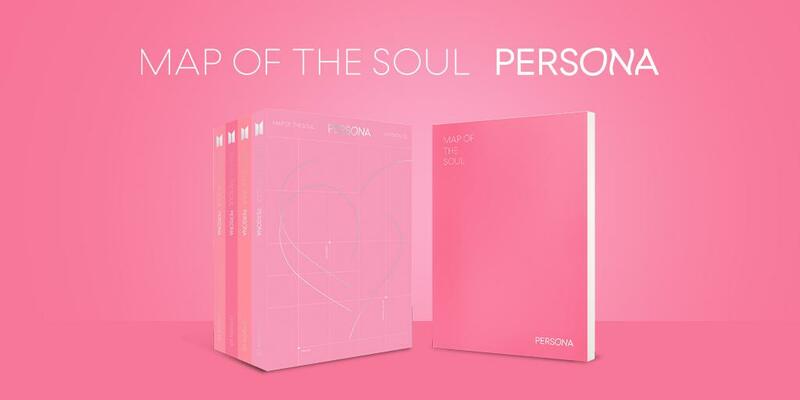 Contest ends April 15, 2019. Prizes will come directly from Author Jessica E. Subject and are not sponsored by anyone else. Good luck! Thank you to all of you who visited my post last weekend! 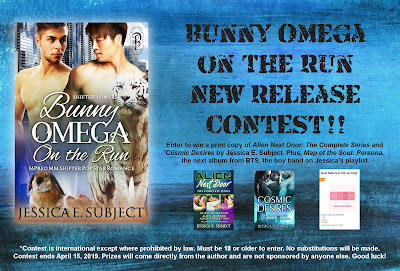 I'm continuing with more BUNNY OMEGA ON THE RUN, an MPreg MM Shifter Pop Star Romance. This story is now available in digital and print at Amazon. And I'm hosting a release contest. Find that at the bottom of this post. Set-up: Last weekend, Kish ran into TK for the second time in one week. I froze for a moment then glanced around to make sure I wasn’t dreaming, that TK had actually asked me to lunch. “Why?” I asked, unable to think of anything else to say, not understanding why he wanted anything to do with me, unless he wanted me for lunch. Hello! Thank you so much to all those who have supported me with the release of Bunny Omega on the Run! I'm super happy with how well it has done, and the reviews that have been posted. I'm so very grateful!! The prizes are two of my books and the brand new album (releases April 12) from my favorite musical artists. Be sure to enter! I am also having a mini blog tour that starts tomorrow. There are four stops total. I hope you will stop by the blog of each gracious host. 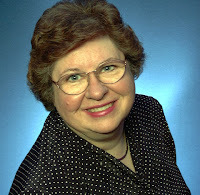 You can enter my contest at these blog stops, too. Thanks so much for having me here today, Jessica! Writing an adventure is fairly easy for me. All my science fiction stories are adventures. I like action-adventure movies. (I like romantic comedy, too). Star Wars IV: A New Hope hooked me with the music. John Williams soaring score conveyed the excitement of an adventure. A quest. Early in my writing career, I learned about Christopher Vogler’s The Writer’s Journey, based on Joseph Campbell’s The Hero’s Journey. That’s sort of what I was doing subconsciously. Once I read the usual steps the hero takes on her quest, the story flowed. My favorite step is the mentor. Think Obi-wan Kenobi. The older character who guides the hero. 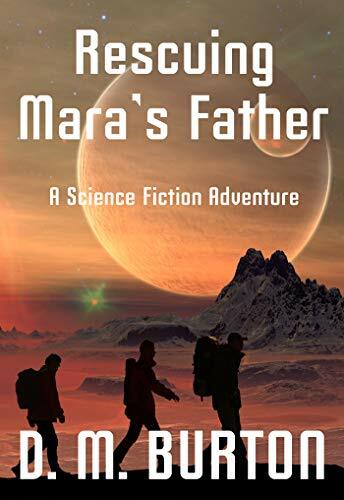 In my middle grade science fiction adventure Rescuing Mara’s Father, fifteen-year-old Mara has been working at spaceport with an old mechanic, Basco. When her father disappears (arrested by an evil queen’s guards), Basco helps her. He knows more than he lets on. Basco reveals he and her father set up an escape route for her, in the event the queen ever found them. But, Basco rarely explains. He partially answers questions then changes the subject. He’s so skillful, Mara doesn’t realize that he’s holding back until later. Still, he gets her off-planet and on the way to the queen’s planet. Just like Obi-wan, Basco doesn’t go the whole way. No, the hero must do that. When Basco leaves, Mara’s devastated. She can’t go on alone. She’s scared, she’s too young. Basco reminds her she has the skills. She can do it. Before he leaves, though, he offers her an out. He can get her far away from the queen, establish a new identity, hide. But that would mean leaving her father to the queen’s tortures and, probably, death. She can’t do that. The mentor’s job is done. He’s helped the hero to a point where she is capable of going on alone. I wrote Rescuing Mara’s Father for my grandchildren. They know I write novels. They also know they have to wait until they’re adults before they can read them. The idea of writing an adventure story for them popped into my head and wouldn’t leave. Since my family’s favorite adventure movies are the Star Wars’ franchise, it seemed logical to write science fiction. I can’t wait to hear their reaction to my story. “We are not going after your father,” Basco says. “What?” Jako and I whisper-shout in unison. I hate that he reminds me. Of course, I remember the lectures on corrupt governments among the Central Planets, especially Compara. But that was just lectures. Words about places as far away and as removed from us as storybook tales. Now it’s real. Father is Queen Bormella’s enemy. Hang on, how would she even know him? We live out on the Frontier. How could he be her enemy? Stars and asteroids, she tortures and executes her enemies. If she wants me, I must be her enemy, too. Fear for Father, fear for myself overwhelm me. I slide down the wall and struggle to breathe. Join D.M. Burton's readers’ group on Facebook. You can change your mind at any time by clicking the unsubscribe link in the footer of any email you receive from us, or by contacting us at jessicasubject.writer@gmail.com. We will treat your information with respect. For more information about our privacy practices please visit our website. By clicking below, you agree that we may process your information in accordance with these terms.